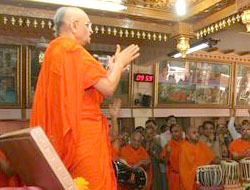 Fulfilling the forecasts of the ancient Hindu scriptures, supreme Purna Purushottam Lord Shree Swaminarayan manifested in the village of Chhapaiya in Northern India. The date of the almighty Lord’s arrival was Vikram year 1837, Chaitra Sud 9, 2 April 1781 CE. 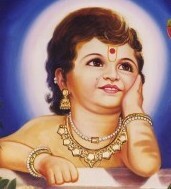 Assuming the guise of an adorable baby, the Lord gave darshan at the home of father Dharmadev and mother Bhaktimata. Each year, on the day of the Lord’s manifestation, disciples pray and rejoice all day. At the precise time of the Lord’s manifestation, they enact the manifestation miracle. Traditionally, a continuous dhoon is held for 24 hours to announce the arrival of the supreme Lord Swaminarayan. The rhythmic chanting of the Lord’s sacred name is a prayer for the Lord to arrive upon the Earth. At the precise time of the Lord’s arrival onto the Earth, the Murti of the Lord is seated on a decorated cradle and offered thaal. Aarti is then performed, followed by hailing the glory of the Lord and describing His magnificent, divine robes and ornaments. Verses and chants, describing the glory of the supreme Lord Swaminarayan are sung, whilst the Lord is gently swung in His cradle. During the day, in the delight of celebrating the Lord’s imminent arrival, disciples forget to even eat. That is the sentiment behind fasting on this special day. Devotees observe a complete fast (oopvas) or eat only fruits or farari food only on this auspicious day. The prasad given on this day is Panchajiri, which is made from five main ingredients (panch meaning five) – ground dhania (coriander seeds), suva (dill seeds), goor (jaggery), topru (coconut) and varyari (fennel seeds). All the ingredients are held together with ghee. 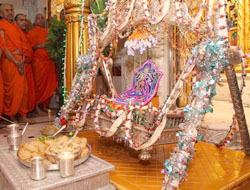 The Lord gives darshan seated in the cradle for 6 days. During the evening of each of the 6 days, sants and disciples sing devotional songs in praise of the Lord.